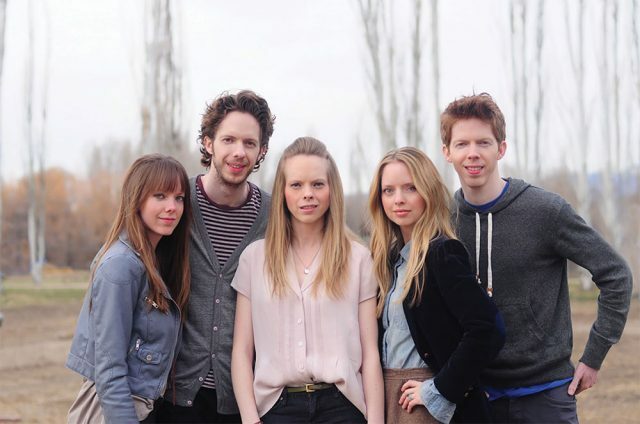 The 5 Browns are bringing their musical talents to Sauder Concert Hall as part of the 2018-19 Performing Arts Series. They are set to perform Saturday, Dec. 15 at 7:30 p.m. The group consists of five siblings: Ryan, Melody, Gregory, Deondra and Desirae. All five siblings were born in Houston, Texas and began their piano training at the age of three. The family moved to Utah in 1991 and grew up in the Church of Latter Day Saints. They were home-schooled while they continued their piano study. Each of them were accepted to Julliard School in New York. Three of their albums went to #1 on Billboard’s Classical Album chart. The 5 Browns tour extensively. They have performed in venues such as Carnegie Hall’s Issac Stern Auditorium, the Grand National Theater in China, Suntory Hall in Japan and Symphony Hall in Chicago. Individually and as a unit, they have performed with orchestras from around the world, including the St. Louis Symphony, the National Symphony Orchestra, the Philadelphia Orchestra, the New Jersey Symphony Orchestra and the Orchestre de chambre de Paris. A highlight in the quintet’s career was a commissioned five-piano concerto written by famed composer Nico Muhly. Under the direction of Maestro James Conlon, the concerto premiered in 2011 at the Ravinia Festival with the Chicago Symphony Orchestra. Outside of their musicianship, the 5 Browns are published writers. Their book, Life Between the Keys, a collection of personal stories was released in 2009. In addition to performers and writers, the group members are advocates. In late 2011, Desirae and Deondra Brown established The Foundation for Survivors of Abuse, a non-profit organization which works for the advancement of victim’s rights. The 5 Browns have also received extensive attention in the media. The quintet enjoyed their first instance of critical acclaim in 2002 when People magazine dubbed them the “Fab Five” at the same time they were featured on Oprah and 60 Minutes. The group was featured in a PBS TV special, “The 5 Browns in Concert,” which aired on PBS affiliates across the country. They have garnered extensive coverage across various media outlets including The Today Show, The Tonight Show, Good Morning America, and The View. In April 2018, the documentary “The 5 Browns: Digging through the Darkness” was released. The film chronicles the struggles the siblings experienced both within and outside of the home during their rise to prominence. They have also been featured in print media via The New York Times, Parade, The L.A. Times, and Entertainment Weekly among others. Tickets for the Dec. 15 performance are available at tickets.goshen.edu, through the Music Center Box office or by phone at (574) 535-7566. Tickets are $45, $40, and $30.